When I said you can hack the redFrog, I wasn't kidding. Periodically, I get questions from users of the site regarding torque and how much is required to move certain masses and a recent user emailed me specifically and it gave me the happy motivation to add this page. :) These masses are things like the gantry, or the z-axis assembly with the router mounted moving on the y-axis, or the just the router mount and router within the z-axis assembly. The question is usually in the form of, can my ??? 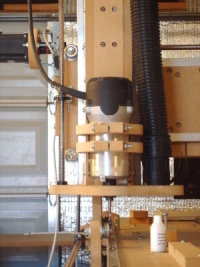 oz-in motors be used on your CNC machine. Check out my new wiring videos here. They are full of great information on wiring the motors and drivers in a much easier way, and with troubleshooting and testing throughout.